ACCOUNTING AND THE EMERGING CALIFORNIA CANNABIS INDUSTRY: We Make It Simple and Easy. Yearly Fee $12,000. Cannabis businesses run into a variety of accounting problems, including lack of banking services, Internal Revenue Code section 280E, IRC 263A and Treasury Regulation 1.471. No hunting for a suitable and experienced finance team to ensure you are complying with both State and Federal tax laws and regulations. Our team takes the worry off your back. We do all of the accounting and tax reporting for our Equity Share participants. Our lawyers and CPAs are knowledgeable about the cannabis industry. Cannabis is still a largely new frontier, but that is all we do FULL TIME. We understand the effect of Internal Revenue Code Section 280E, which concerns the taxation of illegal income and specifically what deductions are allowable. Many financial institutions do not allow legal cannabis businesses under state law to use their services until the federal ban on cannabis is lifted. Many cannabis businesses are forced to keep a lot of cash on hand, making them susceptible to robberies, safety concerns, and ugly audits. We are working on a solution to allow you cannabis business to have access to a banking solution. We are developing a full ERP system based on the world-class VisionCore accounting system and developed operating procedures and a general ledger chart of accounts to ensure you can take every deduction possible. We were not able to find a system that did what we wanted; so we sat down and developed our own. More than 6% of operational cannabis companies surveyed by Marijuana Business Daily said they have been audited by the Internal Revenue Service, which suggests that the industry faces more scrutiny on the tax front than other sectors. Testing labs reported the highest rate, with roughly 13% saying they have been audited, followed by dispensaries/recreational cannabis stores (nearly 8%) and ancillary companies (6%). Wholesale growers reported the lowest rate, with just 2.9% of those who responded to the survey saying they have been audited. The IRS reports that it audited about 1.4% of all U.S. businesses in 2014, which is actually down from previous years due to budget constraints. We do the accounting for you and will be right next to you to deal with the IRS if they come knocking. There are a variety of solutions being offered by startups in the Cannabis industry to solve processing solutions. The two big cultivation software vendors have moved to providing services at the State Government Level. None of the offered solutions provide full absorption accounting as required by IRC 263A and Treasury Regulation 1.471. Even worst, the systems available have no financial reporting capabilities or have a world-class sales management system. We are solving a range of issues concerning stability, reliability and true integration from seed to sale by our software and hardware solution based on the VisionCore ERP system. The solutions will blow your mind. There are still many companies that do not do business with a cannabis business, making the hunt to find cannabis-friendly business merchants difficult. We have lined up cannabis-friendly providers, including merchant processing, payroll, and insurance. A cannabis business has valuable (and federally illegal) inventory on hand, not to mention a lot of cash if your business is bankless. Inventory and cash needs to be protected from thieves, embezzlement, accidents, and other unfortunate incidents. We provide a world-class security camera system, full inventory counts every 14 days and Just in Time Inventory. We replenish inventory when levels drop below a predetermined level. Our runners bring new supplies as required. We analyze physical inventory counts against what is in the system. Immediate action is taken if variances begin to appear. You will not have to review the security tapes. We do it for you. We have a vested interest in your business and it is our inventory that has been placed into the store on credit. Let's us be the watch-dog you need. Knowledgeable business consultants can help guide you towards success if you’re struggling to figure out how to scale or grow your business. 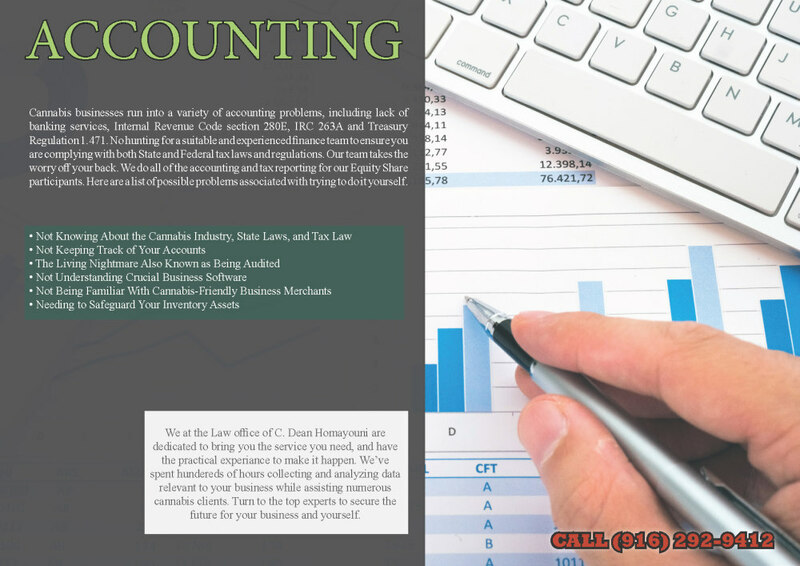 We have a team of lawyers, CPAs, accountants and marketing personnel that do cannabis FULL TIME. This is not a part-time job for us or a way to make a quick buck. Our strength is only as strong as our Equity Program participants. We supply unlimited legal and accounting support to reduce your costs, ensure you get the advice you need and allow you to run your business. VisionCore and the Porting of the QuantumLeaf Cannabis Modules: Why we decided to develop our own solution. We looked at all of the major packages available for the cannabis industry. All of the vendors lacked an acceptable presence in California and none have the infrastructure to handle the number of cannabis businesses in California. In the end, we decided to develop our own solution using the world-class VisionCore ERP, eCommerce storefront and the IRC 280E Tax Crusher Point of Sale system with mobile delivery. These systems are feature rich, with thousands of users and time-tested. ​Your computer system to process sales is mission critical. There is no time for bugs, or excuses or lack of integration to applications such as Microsoft Office. Our ready to go solution has all that you need and want. Stability, reliability and scalability as your business expands. The pricing is extremely competitive and is user based. It is that easy and simple. All of the reports generated by the system download and are formatted for Microsoft Excel, Microsoft Word and Adobe PDF out of the box.